With Fall knocking on the door, I wanted to share one of my favorite getaways from this summer before the season officially comes to an end. In July I spent a quick 48 hours in breathtaking Banff National Park in Alberta with my family. It's a bit surprising that this was my first time in the Canadian Rocky Mountains as it's only a 6 hour drive from where I grew up, and to be honest, I had no idea just how magnificent this pristine wilderness area is. It's on a scale difficult to imagine! Despite the fact that ski season runs through early May, Banff is largely thought of as a summer destination thanks to the meandering hikes, wildflowers and wildlife, and jaw-dropping glacier lakes it is home to. 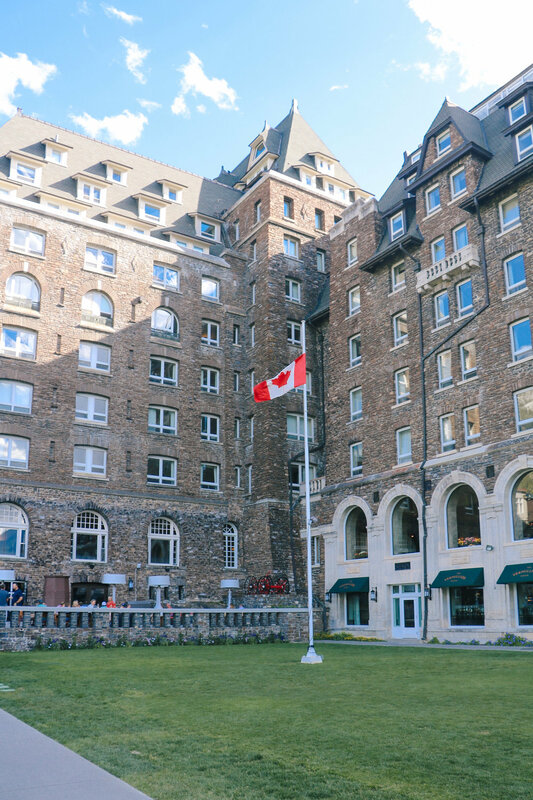 Due to my time constraint and the vast wilderness there is to explore, I won't go into a full travel guide of the area but do want share about two of the park's iconic hotels - Fairmont Banff Springs and Fairmont Chateau Lake Louise - and why they are the perfect home base for any Banff adventure. 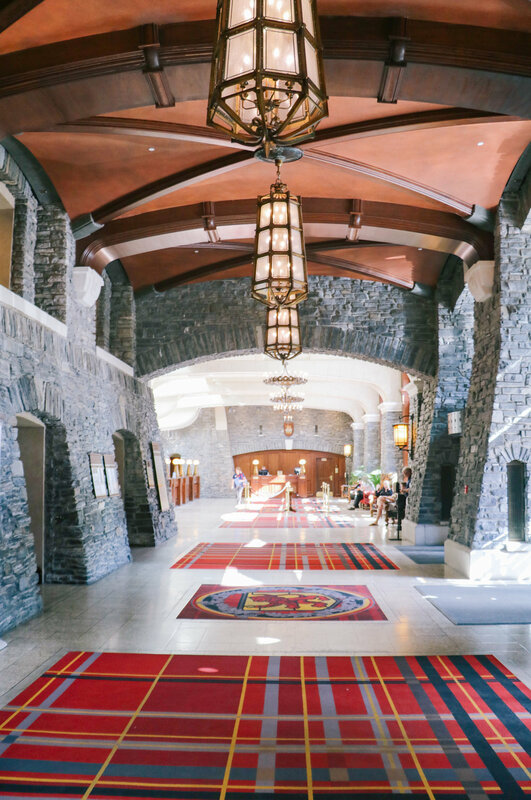 I checked into the Fairmont Banff Springs on a Friday afternoon and upon pulling up to its grand entrance immediately understood why it’s nicknamed "The Castle of the Rockies". Surrounded by majestic mountains and just a short walk from the resort town of Banff, the hotel sits high at 4,600 feet and is more castle than hotel with a stone facade and pointed turrets dating back to the late 1800s. The exceptional stonework continues indoors where grand chandeliers and tartan rugs have you questioning if you're actually in Scotland instead of the Great White North. Banff Springs has over 700 guest rooms - many of which boast impressive mountain views - 12 places to dine, a wide variety of on-site shopping, and a spa outfitted with several waterfalls, as well as a mineral pool, hot tub, and sauna. The list of activities offered is extensive, with everything from fishing and golfing the resort's 27-hole course in the summer, to snowshoeing and dogsledding in the winter. Prior to the majority of my hotel stays, I do extensive research on where I’m staying giving me a good sense of what to expect from my upcoming experience. 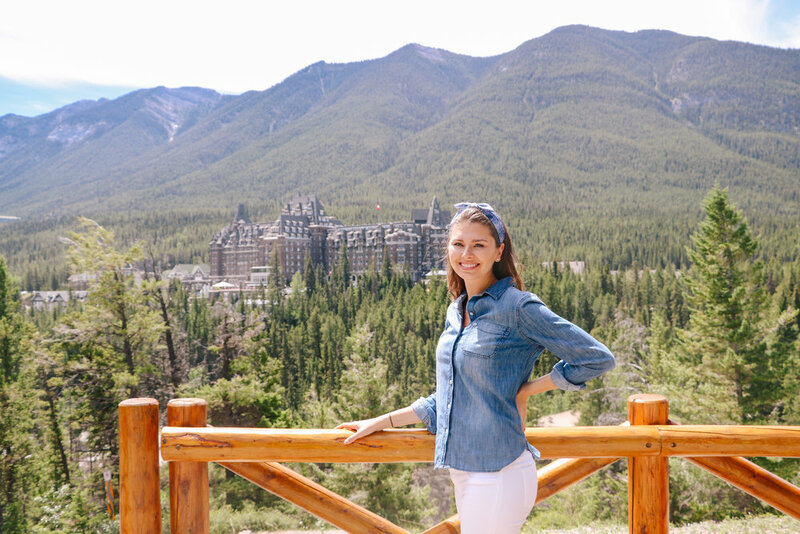 Banff Springs was different as I was traveling with my family and they arranged the hotel accommodations, but I was beyond impressed after my initial tour of the property, primarily thanks to its stunning setting and on-site amenities. Keep in mind Banff National Park is just that - a remote wilderness park - which is what makes Fairmont Banff Springs so great! It’s luxurious accommodations are the perfect contrast to the rugged outdoors you’ll be exploring all day. The hotel’s restaurant scene is strong, and I recommend starting your day with breakfast at STOCK Food & Drink, a bright and modern gourmet grocery and café, and ending the day with dinner at the Vermillion Room, an elegant yet relaxed French brasserie. My favorite part of our entire stay though was time spent at The Lookout Patio - an outdoor Mexican cantina offering an incredible view of Mt. Rundle and the Bow Valley. It was such an enjoyable spot that I went twice during my short stay! Take a forty minute drive Northwest from Banff - which will feel much shorter thanks to the awe-inspiring scenery! 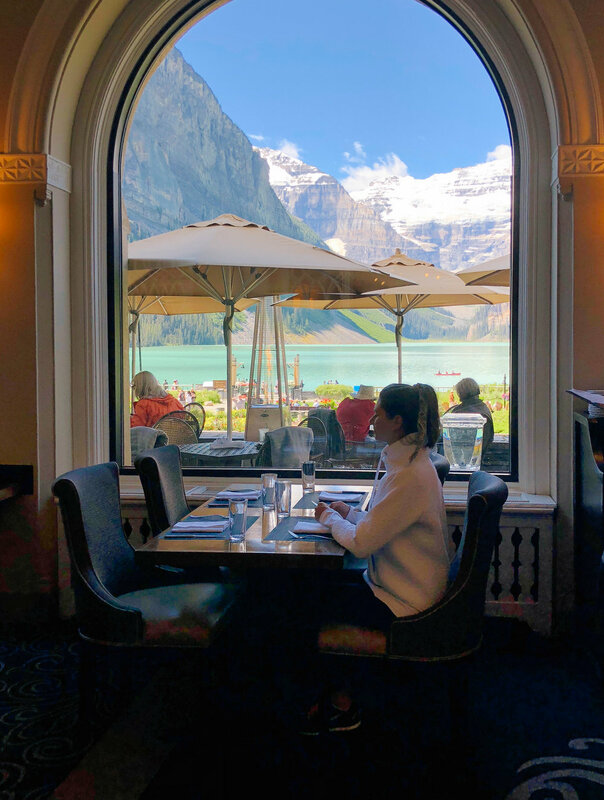 - and you'll arrive at not only one of the park's most photographed landmarks but also another beautiful Fairmont hotel, the Fairmont Chateau Lake Louise. 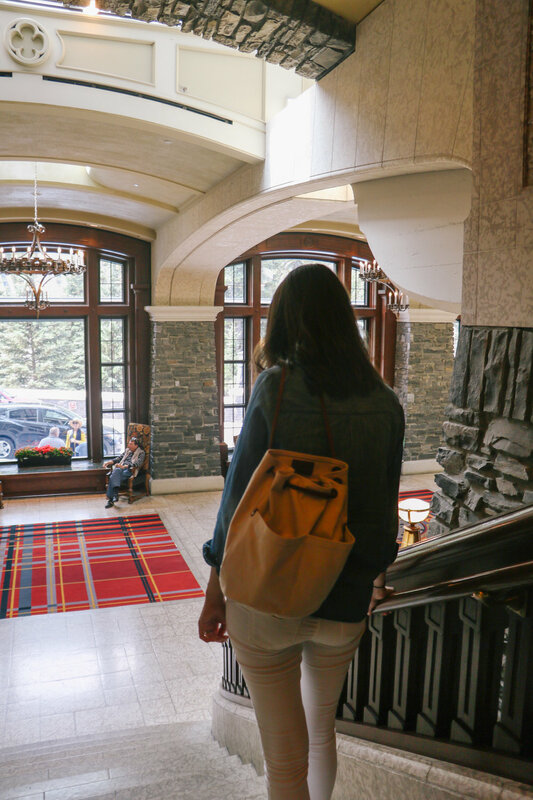 Situated right on the edge of legendary Lake Louise, the hotel is another grand, yet unique, lodging experience. In the winter, the frozen lake turns into one of the most scenic skating rinks in the world, complete with a hand-carved ice castle, and in the summer months its sparkling blue waters make the perfect setting for an afternoon of canoeing. 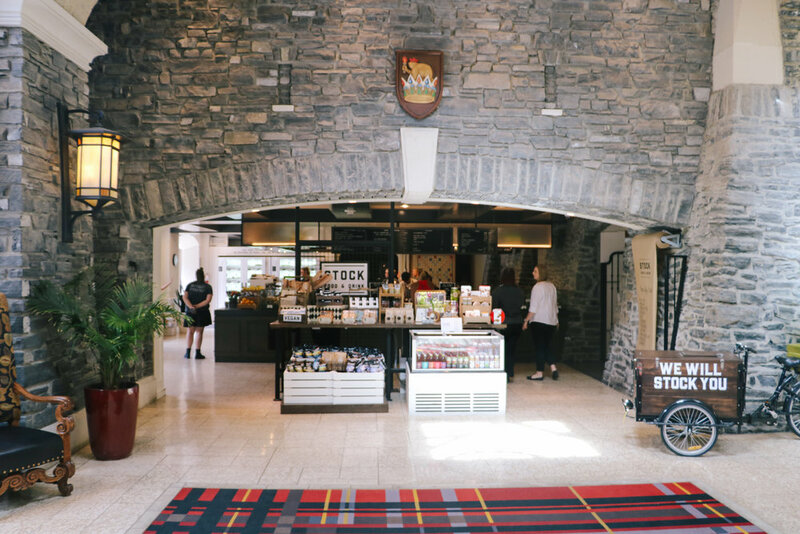 Like Fairmont Banff Springs, its sprawling grounds are comprised of several restaurants, shops, and even a place to rent gear, so there’s no reason to leave if you don’t want to. The interior has a fittingly alpine feel without being rustic, and it’s definitely worth upgrading to a lake view room along the back side of the hotel just for the privilege of waking up to the Victoria Glacier every morning. Again, there are a handful of great restaurants, but I highly recommend having a meal - or a generously poured hot toddy if it’s cold out - at the Lakeview Lounge where each table looks out onto the turquoise water. It’s a one-of-a-kind setting that you must experience during your stay! The area surrounding Chateau Lake Louise is slightly remote, as there’s not really a “town” of Lake Louise, so once you check-in there isn’t much to explore besides the amazing outdoors nearby. And amazing it is as just nine miles from the hotel lies another glacially-fed lake whose milky turquoise waters will stop you in your tracks. Set in the Valley of the Ten Peaks, Moraine Lake is so beautiful it looks fake. I feel like I’ve seen some pretty stunning lakes around the world but none compare to this! 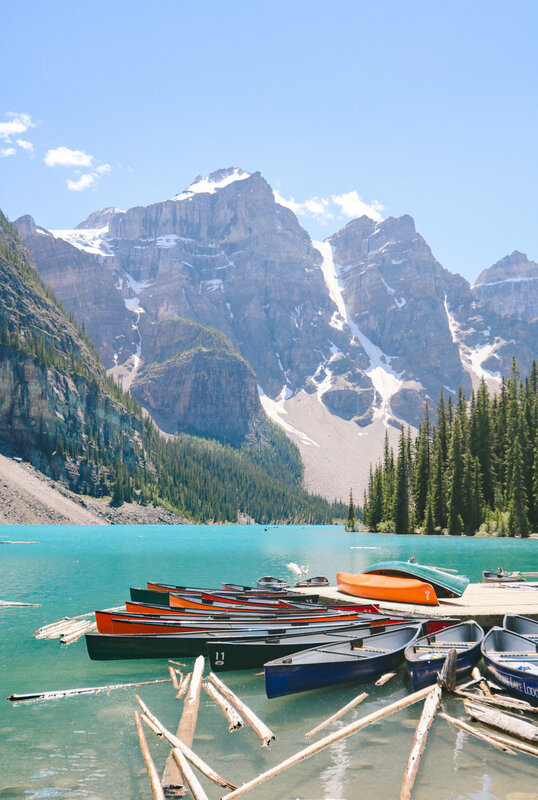 With little hustle or bustle and lots of beauty, many people prefer the more rugged and remote setting of Moraine Lake to Lake Louise and it’s an absolute must-see during your stay! The hotel offers a shuttle service to the lake which you’ll want to take advantage of as parking is near impossible. There are plenty of hiking trails around the lake, but be sure to at least take the easy .5 mile Rockpile Trail to snap the postcard worthy shot you don’t want to leave without. While I can't speak of the rooms at Chateau Lake Louise, I will say that the rooms at Banff Springs are nothing to write home about. That’s not to say they aren’t nice, as they are perfectly comfortable (although the bathroom we had was extremely tiny) and very clean, but know that the steep rate you’ll pay during the summer months is for the location and amenities, not because you are getting an over-the-top luxurious room. One of the things I found to be the most beneficial with staying at a Fairmont was the ease of parking when we visited Lake Louise for the day. Parking is extremely limited near the lake, with most visitors resorting to overflow lots miles away and relying on shuttles to transport them to and from, but being Fairmont guests we were able to pull right up to the hotel and park in their garage for free. It saved us hours of unnecessary travel time and made our experience extremely stress-free and enjoyable. It’s little perks that go a long way! 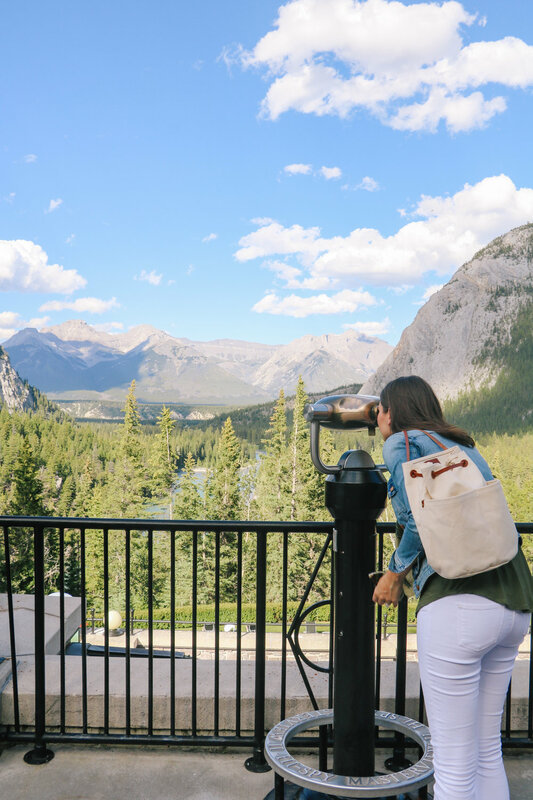 All this said, both of these Fairmont hotels will add a level of charm and hospitality to your Banff adventure that you’ll be hard-pressed to find elsewhere in the park. The main thing you have to determine is if you’d prefer a more tranquil setting or close to the activity the town of Banff offers. Either way you can’t go wrong! Given the nature of the environment, casual attire is the way to go, so fill your suitcase with athleisure wear and comfortable pieces. Also keep in mind that weather in the Canadian Rockies can change quickly. A single day can have a mix of sunshine, snow, wind, and rain, so dressing in layers is key. Banff National Park is located 80 miles west of Calgary’s international airport. From the airport, rent a car and take Trans-Canada 1 west from Calgary straight into the park, through Banff and Lake Louise. 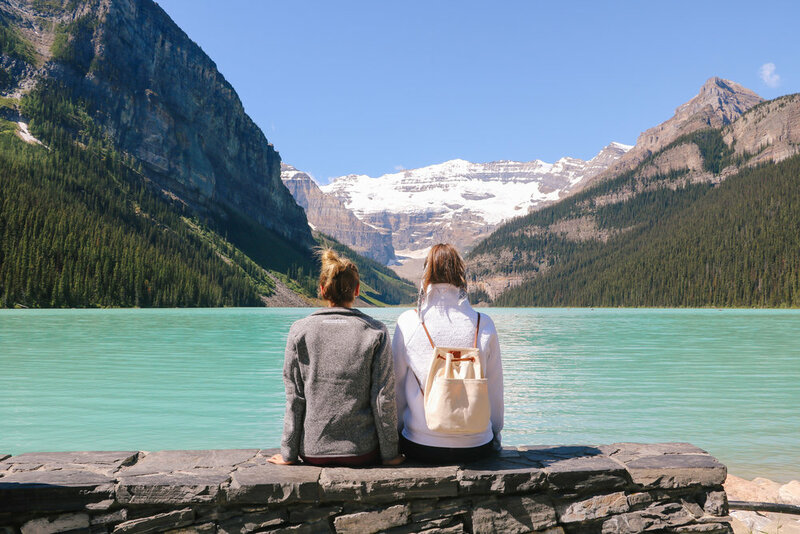 A direct bus service from the airport or downtown Calgary is also available to Banff and Lake Louise, as are shuttle services through tour operators. When you enter Banff National Park, which spans 2,500 square miles of the Rockies, you’ll be asked to purchase a permit for the duration of your stay. The pass will cost you about $15 a day, and is good for use not only throughout Banff but also Jasper, Kootenay, Yoho, Mount Revelstoke, Glacier, Waterton Lakes, and Elk Island.